For the past two years I have attended the Macworld Conference & Expo with my father-in-law. He's been a Mac guy from nearly the beginning. "Macworld isn't just a hall full of exhibitors or rooms of conference session; it's a series of calibrations of the world as you know it. Your perspective will be jolted. Your creativity will be ramped up. You will walk away realizing it's not just the world that's changed. It's you, too." The show is always amazing. Tons of great things to look at, play with and buy. The MacBook Air was great to see up close and is remarkable. Apple never ceases to amaze. I plan on buying a MacBook Pro and upgrading my recording studio set-up as soon as I have the funds to do so. My only concern with the MacBook Air is durability. It would be a cool toy to have, but not until after I've got the "big boy" at home. I bought two pair of ear buds at the show (probably against my better judgement). Last year I was very close to buying a pair, but thought I would wait and ended up purchasing a set of Shure ear buds. Overall I have been happy with them, but they're not terribly comfortable. 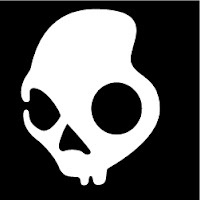 The first ones I purchased were the Skullcandy Full Metal Jacket 11mm (in silver). Unfortunately they didn't have any out to listen to, but the specs and price made it easy to buy a pair. The booth was cool with a DJ and nice displays plus free stuff like bandannas, wrist bands and dog tag like necklaces (logo to your left). After wandering around s'more and listening to a great presentation on recording studio set ups (Dream Studio: Making Music with the Mac) from Berklee College of Music we made our way over and eventually found Creative (where I bought my second pair of ear buds). 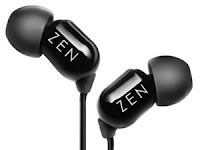 The Creative Zen Aurvana in-ear earphones were an easy sell once I heard them. I wanted to buy the ultra high end over ear noise cancelling headphones, but thought I shouldn't. I spoke with folks about video editing software, studio software and a company that replicates and duplicates CDs and DVDs (AMS - Advanced Media Solutions). AMS had great quality and Matt George the sales and solutions guy that I spoke with made me think that perhaps I should change who I use for replication. Another interesting item of note was at the Belkin booth. The booth was set up like a house with a master suite, gaming room, living room, courtyard and even a car. Like most booths I just whizzed through, but the TuneStudio (click here) really caught my eye (so I took a picture of it - left). "Belkin's TuneStudio for iPod is the first 4-channel audio mixer that lets you create high-quality digital recordings directly onto your iPod. This mixer allows the input of up to four different instruments or audio sources, and records the audio onto your iPod for instant playback." I spoke with a guy at the Guitar Center booth (not that I would EVER buy something from them since I am a Gelb boy) and picked his brain on gear. I also stopped by the Shure booth and got hooked up with more comfortable ear bud covers. The lady there gave me a few sets too (very nice of her). We had a great time and next year I might try and go for two days. I'm hoping by then I'll have my studio set up and be Mac-in' it.